1. 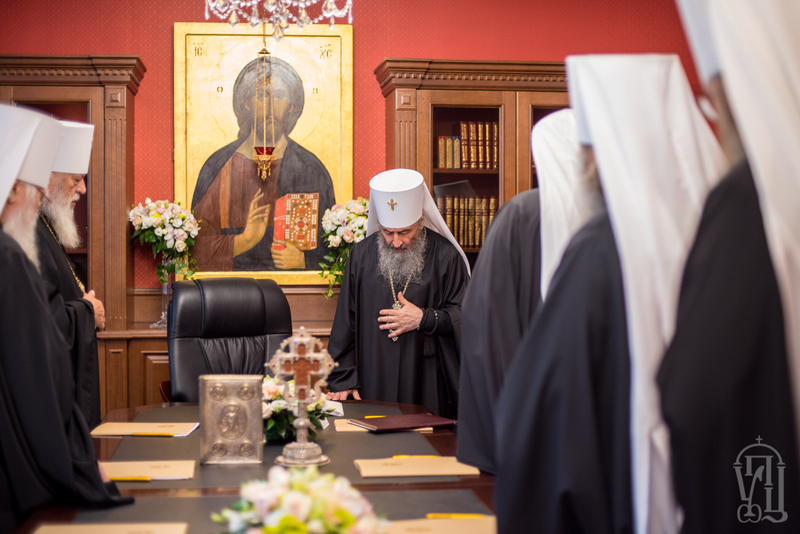 We state that the idea of overcoming the church schism in Ukraine by the granting of a Tomos of autocephaly to the non-canonical church groups (“UOC-KP” and “UAOC”) has turned out to be a grave error. None of the Local Orthodox Churches has recognized this illegal act perpetrated by the Patriarchate of Constantinople and a large part of the Local Churches, notably, the: Antioch, Russian, Cypriot, Serbian, Polish, Albanian, and Orthodox Churches in the Czech lands and Slovakia, in various forms, have already expressed their disagreement with the decisions made by the Constantinople Patriarchate. Local Churches have also confirmed that they do not recognize the newly established “Orthodox Church of Ukraine” (“OCU”) and regard the clerical Cheirotonia [consecration.—OC] in this structure as illegitimate and prohibit its own clergy to have any prayerful contacts and liturgical concelebration with its representatives in any form whatsoever. Thus, there was no positive response nor indeed acceptance by world Orthodoxy of the actions perpetrated by the Patriarchate of Constantinople; which, in fact, has attempted to legalize the schism. Accordingly, the legalization of the schism—is not the way in which church unity can be achieved. We remind you that according to the historical-canonical tradition of the Church, autocephaly is provided only to a single Church within a certain state, and not to any part that has broken off from the Body of the Church. 2. It must be admitted that the historical and canonical arguments presented by the Patriarchate of Constantinople regarding its own right and the possibility of interfering in the affairs of other Local Churches is totally unfounded, artificial, false, and contrary to the Church’s canons. Accordingly, the Patriarchate of Constantinople does not have any right whatsoever to interfere in the church life of Ukraine. The actions and arguments of the Patriarchate of Constantinople, which illegally lifted the anathema from the chief culprit of the Ukrainian church schism, Philaret Denysenko and also recognized the hierarchy of the UAOC which does not have apostolic succession at all, testifies to the fact that the Phanar does not fully comprehend the true essence of what is happening in the Orthodox environment of Ukraine. In fact, Philaret Denysenko was not anathematized for seeking autocephaly, as stated by the Patriarchate of Constantinople, but for his immoral personal life, the unrepentant grave sin of creaitng a schism in the Church, the creation of a parallel schismatic hierarchy, and a quasi-church structure that, throughout its existence, has resisted and continues its struggle under another name against the canonical Ukrainian Orthodox Church (UOC) and even now threatens to destroy the unity between the Local Orthodox Churches. 3. It should be noted that the actions of the Patriarchate of Constantinople in Ukraine has caused great harm to Ukrainian Orthodoxy, and also became a threat to Pan-Orthodox unity. We believe that the Patriarchate of Constantinople and personally Patriarch Bartholomew must admit their mistake and start working on correcting it. A way of rectifying their mistake could be to rescind the granting of the Tomos, call for the schismatics to repent of their sin of schism and convene a Pan-Orthodox Assembly in order to facilitate a conciliar decision which may help resolve the Ukrainian ecclesiastical question. 4. Ecclesiastic reality in Ukraine illustrates that for Orthodox Christians, the Tomos did not bring with it any unity, peace or respite as was promised by the initiators of this idea from church and state circles a year ago. Instead, the fruits of the Tomos became violence, conflict, confrontation, tears and suffering for the faithful of the Ukrainian Orthodox Church (UOC). All these facts testify to the fact that the simple legalization of schism does not change the schismatics themselves who remain hostile and aggressive to the Church. Only repentance and true recognition of their mistakes by the schismatics to the Church and their return unto the bosom of the Church can bring true peace and unity in the church life of Ukraine. 5. Coercive force, discrimination and violation of the rights of the faithful of the Ukrainian Orthodox Church have already been noticed by international human rights organizations. In particular, this was reflected in the latest report of the Office of the United Nations High Commissioner for Human Rights (OHCHR). These offenses, often supported by local authorities, compromise our country in the world. Violence, the forced seizure of our churches and other unlawful acts will not lead to church unity in Ukraine. This is a false path to take and one needs to have the courage to recognize this mistake. We respectfully request that representatives of the ruling authorities stop their artificial initiation of the change of jurisdiction of our parishes, since our clergy and parishioners do not have this internal desire. We believe that the campaign to discredit the Ukrainian Orthodox Church, the prohibition of the presence of the clergy of our Church in the army, attempts to forcibly change the name of our Church and other similar anti-church actions is a strategic mistake of the authorities in the field of internal politics and stability in our country. 6. Of particular concern is the fact of the criminal prosecution of the cleric, Archpriest Viktor Zemlyanoy, of the Rivne Eparchy of the Ukrainian Orthodox Church. For the first time in Ukraine’s independence, a priest who protects the rights of believers and freedom of religion is being unreasonably prosecuted and accused of incitement to religious hatred. 7. We ask the state authorities not to interfere in church affairs, and thereby not contribute to the incitement of religious hatred through their actions, and to also cancel the requirements of the Law of Ukraine No. 2673-VIII of 17.01.2019 on the compulsory renaming of the Ukrainian Orthodox Church as being unconstitutional and contrary to the norms of Ukrainian and international law and basic principles of human rights and freedoms. We also appeal to the government not to facilitate forcible seizures of our Church parishes by illegal re-registration. The Lord gives rulers power not for the creation of discord in society, but for the cultivation of peace, tranquility and harmony among all citizens of the country. 8. We appeal to the representatives of the newly formed structure—the “Orthodox Church of Ukraine” (“OCU”)—with a request to remember the words of Christ that love for our neighbor is the sign of a true Christian (see John 13:35). The more violence on your part towards our believers today, the more distant will be the prospect of restoring church unity in Ukraine. The fact that you seize our churches together with the involvement of political, state, and sometimes even paramilitary structures, expelling our church communities into the street, forcing them to pray in the open air or in non-adapted premises; we perceive with Christian patience. We are reviled, and yet we bless: we are persecuted, and suffer it. We are evil spoken of, and we pray (1 Cor. 4:12-13). In this patience we humbly pray and await the time when Christian love will overcome hatred, malice and hostility, and we will be able to meet you on the threshold of the Church and hug you as brothers and sisters who have returned home. 9. We express our gratitude to those Local Orthodox Churches, which have already supported the canonical ecclesiastical order and did not agree with the legalization of the schism. We also thank those priests and believers who lost their churches that were seized, and still retained their loyalty to the Church. We call upon the clergy and the faithful of the Ukrainian Orthodox Church to help and support the priests and communities whose churches were forcibly seized, bearing in mind the words of St. Paul: Bear ye one another’s burden and so fulfill the Law of Christ (Gal. 6:2). 10. During these salvific days of holy Great Lent, where we have already passed the half way point to the Holy and Bright Feast of the Resurrection of Christ. We ask everyone to pray that the Lord preserve the unity of Holy Orthodoxy, strengthen us to remain steadfast for the Truth of God, and grant us peace, tranquility and mutual understanding in our Ukrainian state. May our Lord God bless us all! Protodeacon Vladimir Vasilik examines the statements of the Constantinople hierarch Archbishop Job (Getcha) of Telmessos from a recent interview that he gave concerning the history of Church in Kiev and its relation to the Patriarchate of Constantinople and the Moscow Patriarchate, offering several necessary and helpful corrections to the misinformation put forth by Archbishop Job via an indepth look at the history and relevant sources.